The Gainesville real estate market continued to improve in 2016. It took less time to sell more homes for more money in 2016 vs 2015. 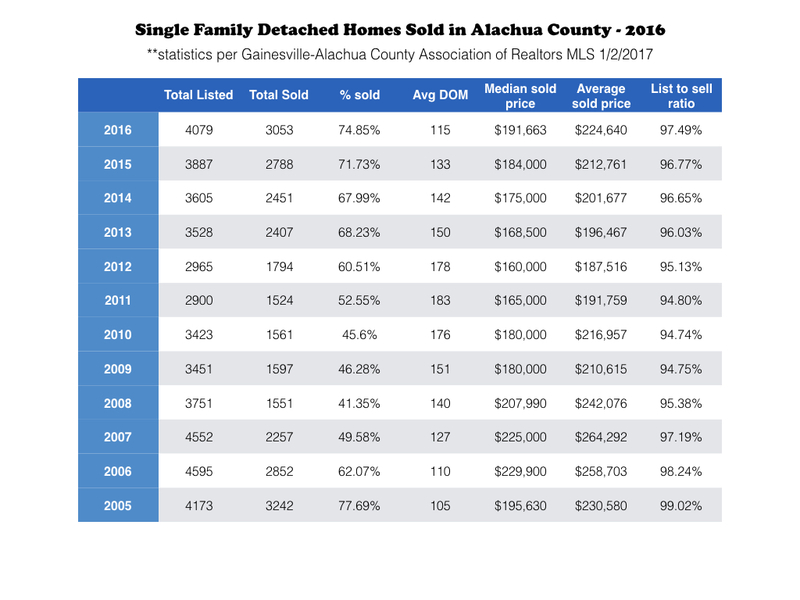 Analysis of data gathered from the MLS for the Gainesville-Alachua County Board of Realtors reveals that sales of single family detached homes in Alachua County rose 9.5%, from 2788 homes sold in 2015 to 3053 homes sold in 2016. Median sales price of detached single family homes sold in Alachua County rose 4.16%, from $184,000 in 2015 to $191,663 in 2016. It took an average of 115 days to sell a home in the Gainesville real estate market in 2016, a 13.5% drop from 2015 when it took an average of 133 days to sell a home. Distressed sales (short sales and foreclosures) continue to move out of the Gainesville real estate marketplace, contributing to the rise in sales prices. In 2016, distressed sales comprised 9.9% of all single family detached homes sold in Alachua County (287/2905), a drastic drop from 2015 when distressed sales comprised 18.3% of all homes sold (511/2788). Alachua County condo and townhome sales were brisk in 2016. Sales of Alachua County condos/townhomes increased 14.34% over 2015, with 821 selling in 2016 as compared to 718 sold in 2015. 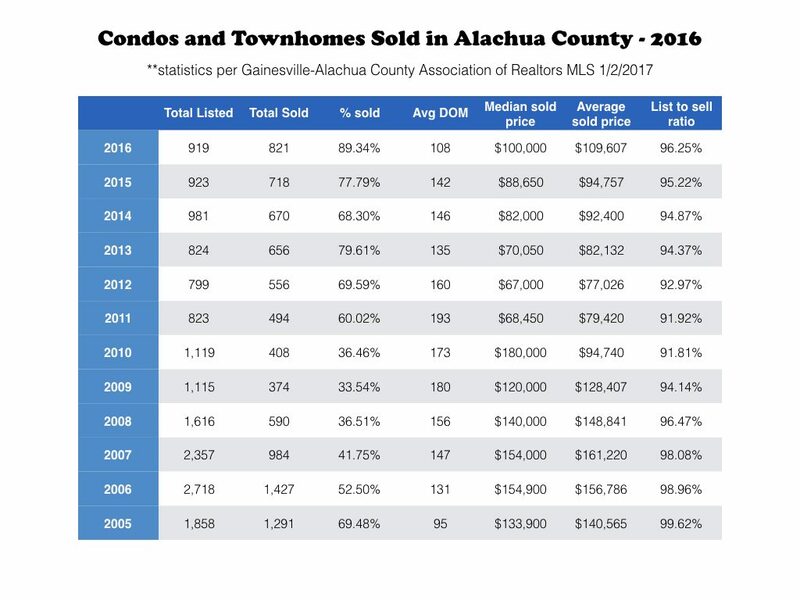 Median sales price of Alachua County condos and townhomes jumped to $100,000 in 2016, a 12.8% increase over median sales price of $88,650 in 2015. Distressed properties (short sales and foreclosures) accounted for 9.2% of all Alachua County condos and townhomes sold in 2016, compared to 2015 when distressed sales accounted for 18.8% of this market segment. If you are serious about buying a home in Gainesville in 2017, don’t lowball. It’s not going to work. Sellers know that the market is in their favor. A stronger real estate market is great news for you! However, pricing your home to sell based on what the market will support is still your best ticket to getting your home sold for the most amount of money in the least amount of time.